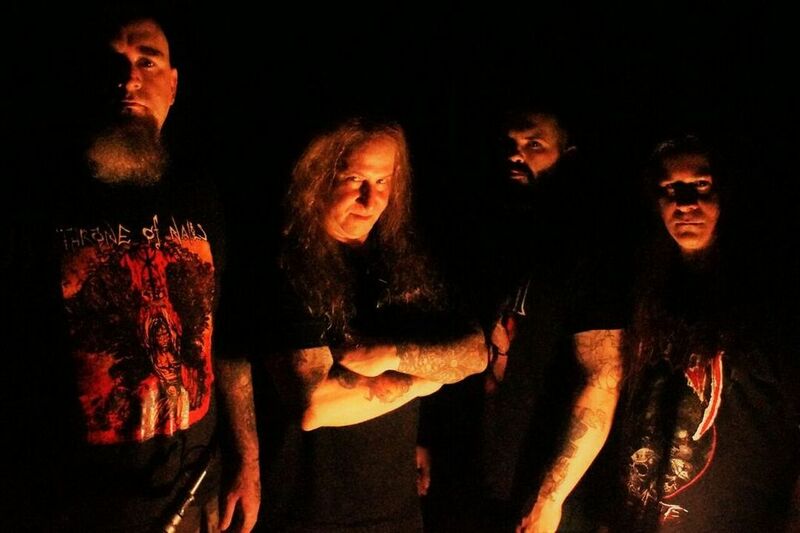 There has been a lot of upheaval in Malevolent Creation since their last album, 2015’s Dead Man’s Path. Vocalist Bret Hoffman left the band in 2016 and passed away last year. There were also other lineup changes for The 13th Beast, with guitarist Phil Fasciana the only holdover. Fasciana fills us in on the new lineup, dealing with Hoffman’s passing, touring and other topics. Chad Bowar: How did Lee Wollenschlaeger (vocals, guitar), Josh Gibbs (bass) and Phil Cancilla (drums) come to join the band? Phil Fasciana: I had known Josh because he lives near me and played bass with Solstice and I knew he was a great musician and a very cool friend, so he was the first person that I got in the band. Our drummer Phil was also a friend of mine for a few years that I met when he was touring with Hank Williams 3 and played drums in Hank’s grindcore band. Lee, our vocalist/guitarist, was the missing link for us because after he had submitted an email to me with himself singing MC songs and songs he had written and recorded by himself I was so impressed that I contacted him immediately and after talking with him he was completely ready for the job. I’m very lucky to have such great fresh blood in the band and we worked great together when it came time to write and record the new album The 13th Beast. Was there any doubt that the band would continue after Bret’s illness and death? Yes. I was considering changing the band’s name to Envenomed and continue playing all the old MC songs being that I have been the main song writer and started the band in 1986 with Bret on vocals. Bret has been my best friend since I was 10 years old and we were like brothers and I couldn’t imagine playing live without him under the MC name. But Bret told me to continue with the band and to find the best musicians I could and continue with the band. It was a very horrible time for me when he had told me he had cancer and we talked as much as we could and were planning on having him write some lyrics and contribute some vocals to the new album. But his cancer got so bad so fast that it was just not possible and all I could do was pray that he would get better and beat cancer. Unfortunately the cancer was too extreme and took his life so fast that everyone that knew Bret was just devastated. Believe me,I think about him every day and have dreams about him just about every night. He was one of a kind and very humble man and great talent that was taken from us all way too soon. I don’t think I will ever get over the fact that I will never see him again. With the new lineup, how did the songwriting process for The 13th Beast compare to previous Malevolent Creation albums? Me and Lee were exchanging ideas and demos by email and recording songs with a drum machine. Lee is a master at programming drums so he already had quite a few songs that were almost ready. I had to basically record my songs to a click track and send them to our drummer. But actually everyone wrote music for this album and sent the music to our drummer Phil so he could put his talents to the music. Even Phil wrote songs as well but we had to many songs by the time we started recording so we still have five more songs that we will be releasing on EPs and splits. We have some great talent in the band now and having four song writers in the band that share the same ideas that I do had been a dream come true and took a lot of pressure off of me do do everything. What led you to mostly self-produce this one? Just like the last album we recorded everything in different studios, but we recorded all the guitars and bass at SBS studios here in Ft.Lauderdale, Florida that is owned by a good friend of mine Mike Gallo. We tracked the whole new album here in Florida at SBS studios this time and our bass player Josh Gibbs actually recorded/engineered the album and like the past album we sent it to producer Dan Swano to mix and master the album and he did a great job on both albums. It took a bit of time to do things ourselves, but we had a great studio to record in and luckily our bassist Josh is also a producer and ended up engineering the recording process due to some problems we had with our former engineer. How has your sound evolved from Dead Man’s Path? In my opinion this new album follows the continuation of Dead Man’s Path. The songs are very fast and strong and for a band that has been around as long as us we always want to continue playing extreme death metal and we really liked the way Dead Man’s Path came out so I think between all the band members we just wanted to record an album similar to Dead Man’s Path but create even heavier songs. With new band members you would think that there would possibly be a change in the sound of the band, but everyone in the band is really behind be with creating music that still sounds like MC. I couldn’t be more proud under the conditions we had to deal with. Bret’s death really affected me but the new guys really stepped up and helped me get out of my depression. And the new album is great and I hope Bret is looking down on us and is proud of what we recorded. This album is for him and his memory. How did you come to sign with M Theory Audio? They are our North American label that is owned by a former Century Media A&R guy who was a big part of Century Media. We are really glad his label is releasing our new album in North America because CM does not have much of a record company in the U.S. Even our last album was very hard to purchase in the U.S. so were glad that we have a label in the U.S. that is promoting and getting the album out to people. Century Media does a great job in Europe but as far as I know they do not have much of a label in the U.S. We only had one contact from them in the U.S. for our last album and basically did no press and had no promotion. I never even saw our last album anywhere in stores. So finally we have proper distribution in North America. What led to releasing the album in Europe and elsewhere in January, but not until March in North America? Like I said before, Century Media either didn’t want to release it in the U.S. or they simply can’t. Our record deal with them is worldwide but our albums are available in every country except the U.S. unless you buy it digitally or pay a lot of money to buy European versions. Are you satisfied with the response to the album so far? Yes! So far the album has been getting great reviews everywhere and we even cracked the top 100 albums in Germany in the first week sales at #57. So apparently the album is selling quite well and we are finally getting tours booked and getting ready for a couple of years of hard touring. They are very important, I believe. Without the three videos that were released before the European release date of January 18th it would have been really hard for North American fans to get a chance to hear the new music and then purchase the album online. Century Media did a good job by releasing three promo videos for our new album and I’m sure that it helped sell albums and grab some new fans as well. Looks like Latin America is first in April-May. Hopefully some festivals in Europe this summer and a headlining tour in Europe in September so far. But we are still negotiating tours for the U.S. and the rest of the world. We really have a lot of touring to make up for so we will be busy for the next two years touring. We have enough music to last us a lifetime so there is a lot of stuff we want to play live that we haven’t played live in a while and a lot of songs that have never been played live before. With 13 full length albums under our belts there is no shortage of material to perform. With so much material, how do you go about putting together a set list, and does it change from show to show within a tour? We are currently making a huge set list so we can play a lot more songs we haven’t played live and can change our set list whenever we want to. Its gonna take a lot of work to get all these songs we want to play live together, but finally I have band members that are hungry to play all those songs throughout our career that I wanted to play for a long time. We never played in Finland and I don’t know why. And we haven’t played in China or Iceland yet. But we are really working hard on playing everywhere in the next two years. We could probably use some help with booking agents in some of these territories. So if anyone that is reading this and wants to see MC In their country/city please contact me at perishinflames@comcast.net and we can work something out. Tell us about the Bret Hoffman Memorial Fund. There was one or two shows up in N.Y. where Bret lived that did some benefit shows. But unfortunately he passed away before these shows happened because he was supposed to attend those shows. His wife didn’t even have a funeral for him or a mass that was supposed to happen before those benefit shows and it really pissed me and a lot of other people off. But right now our friends in Bret’s hometown of North Tomawanda, NY are doing a GoFundMe page to have a custom made bench with a laser etched memorial and photo of Bret at the Resthaven Memorial Graveyard in his home town. If you go to the MC Facebook page the information is listed to help keep Bret’s memory alive forever. What’s the status of the reissues of some older Malevolent Creations albums? Hammerheart Records is releasing some of the older albums and we are also in talks with other labels about re-releasing most of the other albums. There are so many studio albums, live albums, best of albums as well as DVDs. I would love to see them all re-released because a lot of our old record labels don’t even exist anymore and have ripped us off so bad. I like playing golf. I’m a big sports fan and I like to hang out with my friends and chill out. But music is my life and without it I don’t know what I would do. I’m really old school and I still listen to a lot of metal bands that have influenced me from the beginning of Malevolent Creation, bands like Dark Angel, Kreator, Destruction, Sodom, Death and Morbid Saint are still my favorite bands. I’m not really into the new math metal bands. I really prefer old school heavy music like the bands I just mentioned. I know there are a lot of great bands out there but nobody makes me excited like the old school bands that I grew up listening to. Can’t forget Iron Maiden and Judas Priest either because they were the first metal bands that really got me wanting to play heavy metal. There are so many great bands from the ’80s that I don’t have enough time to name them all. Yes, get out and check out our 13th album The 13th Beast! If you are a fan if extreme death metal you will not be disappointed. I live for this music and I know there are a lot of people around the world that feel the same way I do. Thank you for the interview and we look forward to seeing all you metal fans on tour and we will have a lot if great merchandise for everyone when we play live and online. Metal forever!